One of our Spaghetti Family gets him a Ninja Tiger By Huck Gee!!! 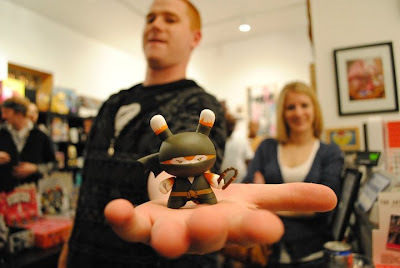 This figure is from the Kidrobot 2010 Dunny Series. This limited 3-inch Ninja Tiger Dunny figure was designed by Huck Gee. Your odds of pulling this figure out of a blind box are 2 out of 25 boxes, which is only a 8% chance. The 2010 Kidrobot Dunny Series was produced at a new facility with a re-designed mold. It has slightly different proportions than Dunny figures from previous series. Dunny figures are highly collectible, made in limited runs and are often hand-painted or assembled.